Quick and easy to use, this streamlined and very portable Vegetable Slicer swiftly cuts everything from parmesan cheese to firm vegetables and fruit into even slices, from paper thin to 3/8" thick. 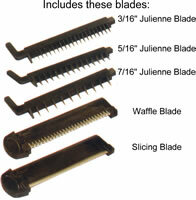 The Vegetable Slicer comes with a Slicing Blade, Waffle Blade, and 3 interchangeable Julienne Blades for shredding and julienne cuts. The non-slip rubber coating on the Stands provides great stability while slicing. The over-all dimensions with legs folded 16" L X 5" W X 3 '12" H, is great for compact storage!